It’s fall in the South, and that means fall sports! Football, soccer, field hockey, baseball, cross-country, wrestling, and the list goes on! 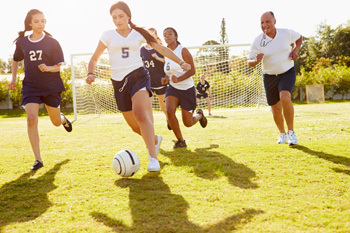 With so many people participating in fall sports, it is important to keep some eye protection tips in mind. Sports cause more than 40,000 eye injuries each year, and 90% of those injuries could have been prevented with proper care and equipment. Basketball causes the greatest number of sports injuries, followed by water sports, baseball, and racquet sports. The most common types of eye injuries are blunt trauma, penetrating injuries, and radiation injury from the sun. Blunt trauma happens when something hits you in the eye and is the most common eye injury cause by sports. If you have had a black eye, you have experienced bruising of the eye and eye lid, which looks ominous, but is usually not a serious eye injury. More serious blunt trauma injuries include a detached retina, a ruptured globe (broken eyeball) and an orbital fracture. Examples of a penetrating injury are being poked in the eye with a finger or object, such as the shuttercock of a badminton set. Radiation injuries involve burning of the retina by the sun’s rays and is most common in summer sports such as skiing, swimming and water polo. So how do you protect your eyes? First, be sure you wear the proper eye protection while playing sports. Polycarbonate lenses are impact resistant and come in both prescription and non-prescription varieties. These are your best line of defense. It is a common belief that wearing a helmet will protect you from all kinds of head injuries, but they don’t cover the eyes, the often-overlooked area vulnerable to injuries. Less serious injuries generally do not require a doctor’s visit – the team coach can usually make the call on continuing in the practice or game, or not. But if you have a serious eye injury, you should quickly be examined by a licensed ophthalmologist, such as Dr. Stewart Shofner. Dr. Shofner is an avid sports fan, and will provide your eyes with expert care. It won’t be long, and you will be released to the sport you love when your eye is healed, and your vision is back to normal.